Donald Trump warned the interstellar press corp that he isn’t afraid to use nuclear bombs against the Martian Colonies. When a reporter tried to explain that the Martian Colonies predate the United States, and are the most technologically advanced race in the galaxy, Trump shook his head. Experts familiar with the aliens in our solar system were horrified by Trump’s remarks. Many pointed out that the Colonists are one of the few species capable of intergalactic travel, and have the most powerful military in the Milky Way. The experts also note that colonial government has publicly states its disdain for the human race, and it is feared that they would use any excuse exterminate humans. 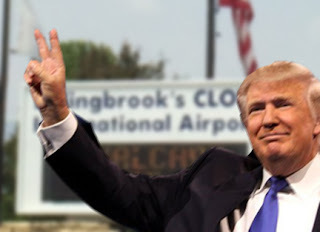 When this reporter tried to contact Bolingbrook Mayor Roger Claar, who is also the head administrator of Clow UFO Base, his receptionist replied that he was in the middle of political strategy session and could not be disturbed.